There are times when your home gets crowded with various items such as (clothes, electronics, etc) because of the limited amount of storage area. Storage bins are cost-effective and easy to use. Organization isn’t about being perfect, it’s about being efficiency, reducing stress and clutter, saving time and money and improving your overall quality of life. Searching for electronics (such as video games controller, remotes, batteries, etc) can be tedious especially if there are too many items in one draw. 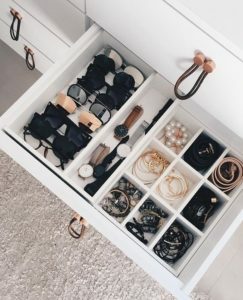 A storage bin can alleviate the stress of searching. 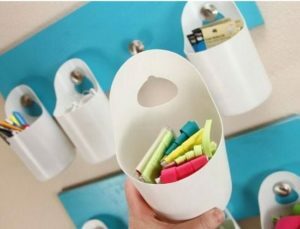 Purchasing a variety of storage bins especially these small hook storage bins that come in different colours, can not only make things easier but cute. Gather each electronics that have different use and put them in individual storage bins and hook them up. More space, less clutter. It can be a task trying to find shoes especially if you don’t have a place to keep them. Storage bins are great for housing shoes and it easy to access. Make shelf at your bedside and use bins to hold shoes, arrange shoes to your liking. the bins can be kept under the bed or even in the closet area. House jewellery/ accessories in storage holder, these are easy and very cute. You can place these in your bedside drawer, on a dresser or even in the closet. Storage bins are great for housing clothes and keep them organized. They are extremely handy, which helps with storing a variety of things such as socks, underwear, t-shirt etc. Seasonal clothing can be kept out of the way in storage bins. This could add to your home decor. Use clear/colourful storage basket and place it behind the pipe or on the kitchen sink. Put dishwashing liquid and sponge. 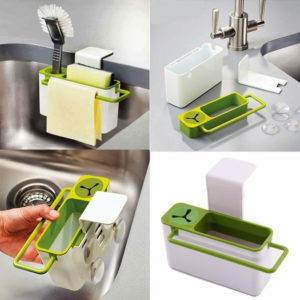 This will eliminate mess and it keeps them organized. 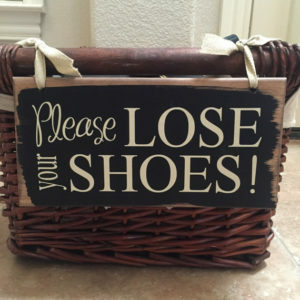 Please lose your shoes! I love this idea. Towels and toiletries can be stored in brightly coloured storage bins. 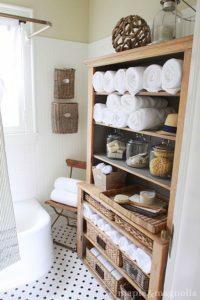 Arrange bins so that towels can be kept in one and toiletries in the other one. These are perfect to be kept in the cabinet. 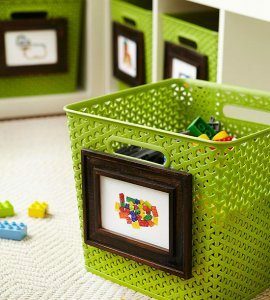 By using Frame Labels your kids can identify where to put their toys. Especially fro toddles who are unavailable to read. I think this is a great idea for parents. Singing a little tune while they’re doing it can make it even more fun. Books can become crowded and bring clutter. 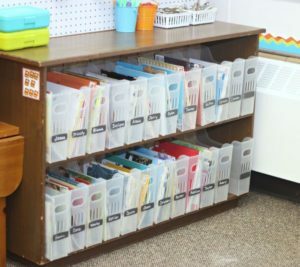 Arrange storage bins on shelves and put books in various categories. 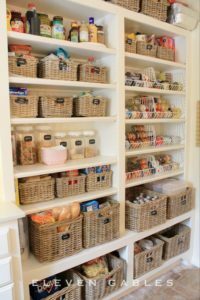 Storage bins with handles are good to keep pantry goods in, this helps conceals them and organize. Put labels on them so it easy to recognize. It’s nice to have pillows in your home. there is comfy and good decor. But they can also cause clutter and make your home untidy. 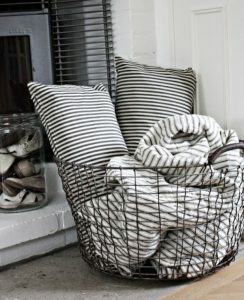 You can house them in a basket near your bedside or under your coffee table in the living area. You can purchase this wire basket here. Storage bins/baskets are handy. No matter what they are good to have around the house. easy and cost effective.